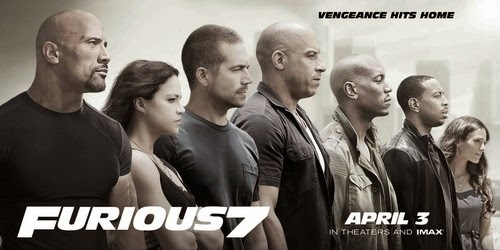 LOS ANGELES, PRNewswire/ -- IMAX Corporation (NYSE: IMAX) and Universal Pictures, a division of Comcast Corp. (NASDAQ: CMCSA), today announced that Furious 7 will receive the widest-ever IMAX release globally. The film begins its global launch on Wednesday, April 1, 2015 before rolling out domestically and in the majority of overseas markets on Friday, April 3, 2015. Throughout its global run, Furious 7 will screen at more than 800 IMAX® theatres, including approximately 445 international and 365 domestic IMAX locations. Additionally, IMAX will be launching its revolutionary new laser projection system at the Furious 7 global premiere event to be held at the TCL Chinese Theatre IMAX in Los Angeles. This marks IMAX's U.S. debut of the new technology as well as the first film ever to receive a global premiere with laser projection. IMAX has undertaken a significant R&D investment to develop its next-generation projection and sound system, which incorporates the laser digital intellectual property IMAX exclusively licensed from Eastman Kodak and Barco's unique laser innovations. IMAX with laser represents a quantum leap forward in cinema technology - providing audiences with the sharpest, brightest, clearest and most vivid digital images ever, combined with a whole new level of immersive audio. The IMAX(®) release of Furious 7 will be digitally re-mastered into the image and sound quality of The IMAX Experience(®) with proprietary IMAX DMR(®) (Digital Re-mastering) technology. The crystal-clear images, coupled with IMAX's customized theatre geometry and powerful digital audio, create a unique environment that will make audiences feel as if they are in the movie.